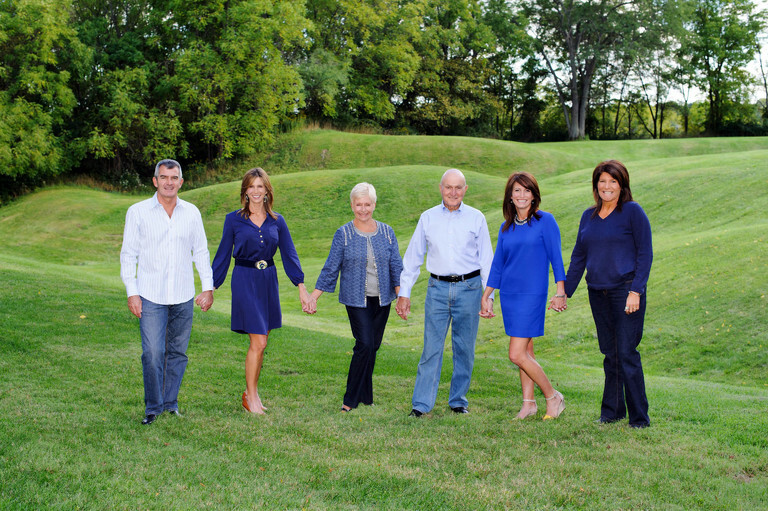 A family portrait is one of the most important investments you’ll ever make …. It is an investment in yourself and in your family’s heritage. Obviously you find value in a professional family portrait or you wouldn’t be taking the time to read this! Style: Think about the type of family you are. What’s your style and how can that be conveyed in your portrait? Would you prefer a formally composed, classic portrait in dress cloths in a formal living room or would you be more comfortable outside at the park in a pair of jeans and a sweater? This will dictate both location and clothing selection. And it will help me make decisions on how to pose you for your portrait. 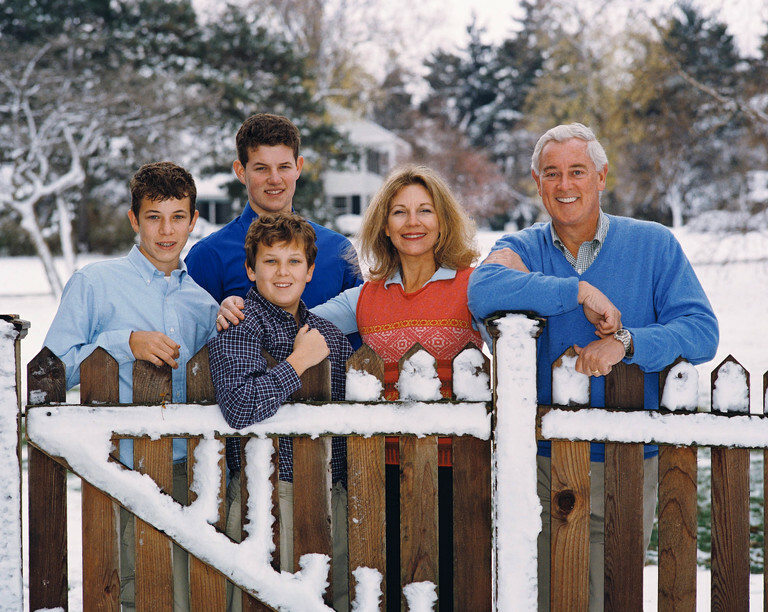 This family wanted their portrait taken informally in their backyard on a snowy winter day. 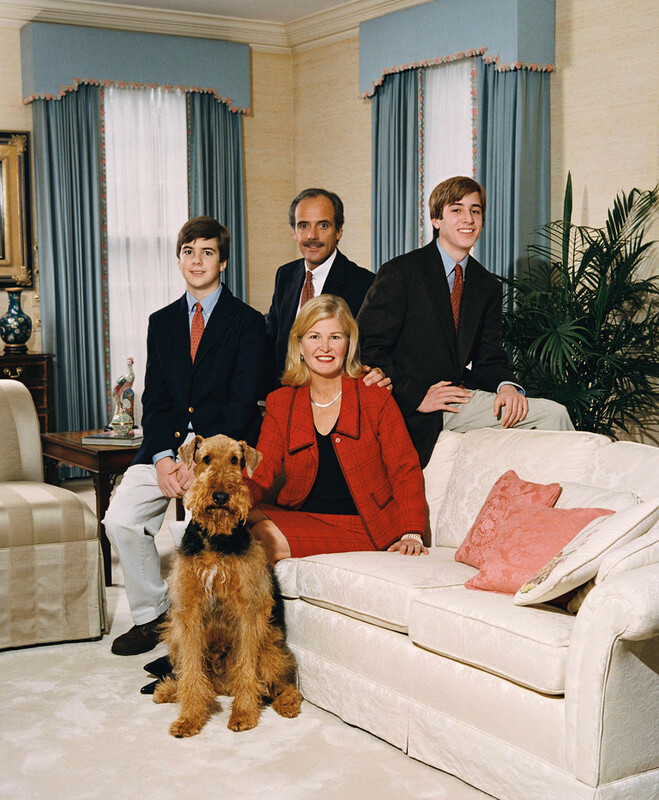 This classic formal family portrait worked well on the wall of this family’s living room. Location: The location of your family portrait can make the final product even more special. I like to let families choose their own location but of course as a family portrait photographer I have many favorites of my own. If there is a place that is special to your family talk to me about it. Your home, a park, an apple orchard, your boat, the beach … all of these have a different flavor and one might fit your families style best. 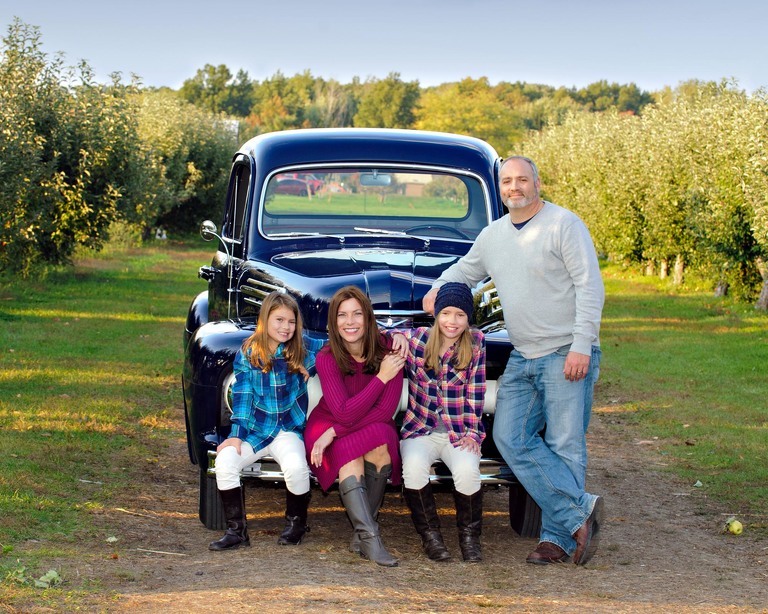 This family chose an apple orchard for their fun, playful family session! And the family’s vintage car was the perfect prop. Notice how their outfits fit the venue. Clothing: Think of the entire family’s apparel as one outfit. This doesn’t mean everyone has to wear the same color. That would be boring! Instead work for balance, harmony, & color coordination. Choose clothing in the same tonal range so that no single family member stands out. Simple classic styles in solids & neutrals work best. I love vivid colors myself but pastels and muted colors work well too. For outdoor & casual portraits khakis & jeans with oxfords, sweaters, and t-shirts work well. If you’re planning on ordering a large wall print consider the colors and style of your home. A casually posed grouping in jeans and sweaters would look great above the fireplace of your paneled family room and a more formal dressed up portrait might look fabulous in a formal living room. Well, you get the idea. Here are some good examples of choosing blues and greens for a natural outdoor park setting. This family shares a love of Ohio State’s football team so they chose red and gray outfits for their themed family portrait session. Props: Props can really ad style to your family portrait. Is there a hobby, special interest or possession that means alot to your family? Talk to me about how we can incorporate it into your portrait. This family lives in the country and the plane belongs to dad. The setting and props say so much about them! Of course your beloved pets are a welcome addition to any family portrait! 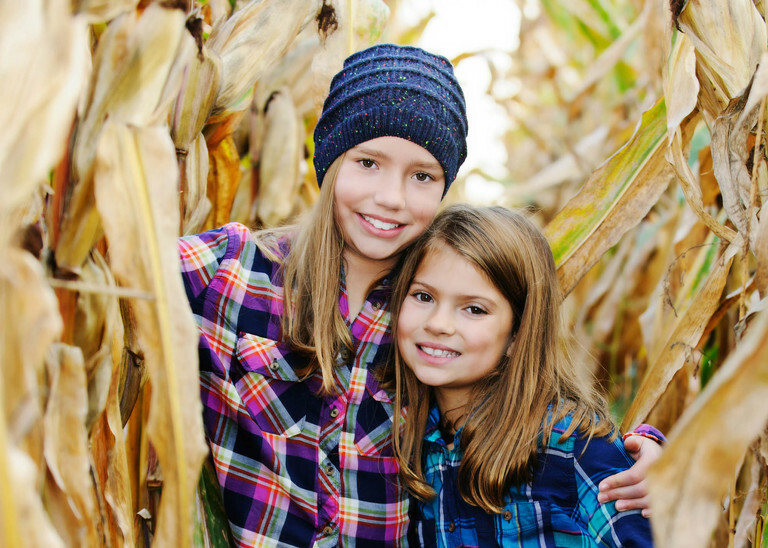 Prepare: Children can make or break a family portrait session. It may seem obvious but make sure the kids are well fed and well rested before your session. Also talk to them about the portrait session beforehand and get them excited about it. Maybe let them pick out their own outfit and props and talk to them about what to expect. If you want to include your pet in your family portrait make sure they are well groomed and on a leash. We can always remove the leash when it’s time to take the pictures. Make sure someone is available to take your pet to the car for the remainder of the session. That way you won’t be distracted. Feel free to call me if you would like to schedule your session or talk about clothing, location or anything else I haven’t covered. And check out my family portrait gallery for ideas on clothing, location and posing. « Awarded One of 20 Best Wedding Photographers in Toledo again!